Sweet Tea—the play was developed and workshopped at the Ellen Stone Belic Institute for the Study of Women and Gender in the Arts and Media at Columbia College, Chicago in 2009. Working with other artists and writers, Johnson turned his staged reading, “Pouring Tea: Black Gay Men of the South Tell Their Tales” into a full length play to fully capture the world of the men in Sweet Tea and to include his own story of growing up as a black gay southerner. Producer of the show, Jane M. Saks collaborated with About Face Theater to produce the world premiere of the show in Chicago in the spring of 2010. 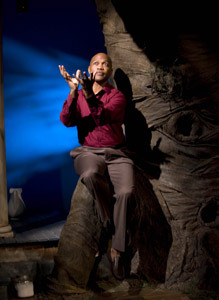 Under the direction of Daniel Alexander Jones, the show opened on May 7, 2010 at the Viaduct Theater for a four-week run. In September of 2010, the show traveled to Austin, Texas to the University of Texas as a part of the “Performing Blackness Series,” at the John L. Warfield Center for African & African American Studies for a three-day run under the direction of Helga Davis. With the thought of a national tour in mind, Johnson revamped the script once more in preparation for a run at Signature Theatre in Arlington, Virginia, under the direction of Rajendra Ramoon Maharaj. In fall 2011, the show ran for four weeks to great reviews. In 2014, Johnson revised the play once again and worked with director Joseph Megel to launch the North Carolina premiere of the show at the Durham Arts Council for two-week run. Stay tuned for future runs at regional theaters in 2014 and 2015. For bookings of the play, please contact Jane M. Saks, CEO of Project& (jsaks@projectand.org). Click here for more images of SWEET TEA.